Miami-based Integra Investments proudly announced today that Aloft Hotel will serve as the signature hotel component at Aventura ParkSquare. Miami-based Integra Investments proudly announced today that Aloft Hotel will serve as the signature hotel component at Aventura ParkSquare. With more than 100 hotels world-wide, Aloft delivers a fresh approach to the traditional hotel landscape, with tech-forward offerings and modern style for the next generation traveler. Developed by an affiliate of Norwich Partners and designed by Zyscovich Architects, Aloft Hotel at Aventura ParkSquare will feature 207 spacious rooms with a cutting-edge design to complement the upscale project, as well as Aloft’s chic W XYZ Bar and an oversized pool deck. Construction on the hotel is scheduled to begin this Fall, with a grand opening to be held in Spring 2017. 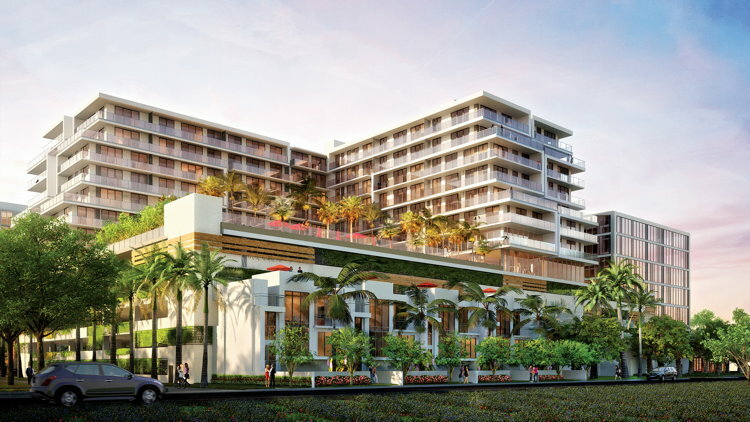 Norwich Partners is also developing the planned AC Hotel by Marriott in Aventura, located directly across the street from Aventura ParkSquare on Northeast 207th Street. The announcement of Aloft at Aventura ParkSquare comes on the heels of record-breaking interest and sales for the project’s office tower, ParkSquare Signature, which reached 100 percent sold after just a few short months on the market. Other sought-after retail brands that have recently signed on to the project include Icebox Cafe, greenmonkey® yoga, and Barry’s Bootcamp. Establishing a new direction for healthy living, Aventura ParkSquare is the first project of its kind in South Florida with wellness as the cornerstone of its design. The nearly 7.5-acre, mixed-use development will stand apart due to its metropolitan feel that promotes an active lifestyle. Extra-wide sidewalks for enhanced walkability; open staircases that support less use of elevators; and the elimination of curbs for greater accessibility will give patrons rewarding health benefits, while shopping, dining, living, working and playing in what is to become the new center of Aventura. In addition to Aloft, Aventura ParkSquare will encompass 55,000 square feet of retail space complete with upscale boutiques, fine dining, and restaurants with outdoor seating; a 131-unit luxury condo tower; a 100,000-square-foot Class A office building with outdoor event space; and a 45,000-square-foot, state-of-the-art wellness medical center with specialty healthcare tenants. Located on the corner of 2900 Waterways Boulevard and Northeast 207th Street, Aventura ParkSquare boasts a prime, central location just minutes from Aventura Mall and Gulfstream Park, and is in close proximity to Biscayne Boulevard and I-95, offering direct access to Miami and Fort Lauderdale. With residences exclusively marketed and sold by Crescendo Real Estate, the project is slated for completion in early 2017. Are you with Aloft Hotels? If you are a member of Aloft Hotels you may be interested in learning how to optimize your content on our network.